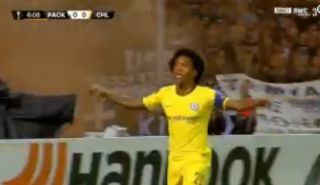 Willian’s goal has put Chelsea 1-0 up in their first Europa League clash of the season away to PAOK. The Brazil international finished well from close range after a flowing team move from the Blues that is fast becoming their trademark under new manager Maurizio Sarri. Willian was named captain for the evening by Sarri before the game – a decision Chelsea fans did NOT take too well to initially. Ross Barkley is getting a lot of credit for his driving run and pass that set the goal up. Ross Barkley at his best there! ? Ross Barkley is working! I like this!